COLOGNE CURIOSITIES-THE UNKNOWN KRAUTROCK UNDERGROUND 1972-1976. Within Krautrock circles, the words “Pyramid Records” are guaranteed to provoke debate. Especially since the rediscovery of the Pyramid Records’ tapes just over twenty years ago. This should’ve been an exciting discovery. After all, it wasn’t every day that a hitherto small, unknown private record label’s back-catalogue was discovered? This was what Cologne based Pyramid Records had been. It was founded by British expat Robin Page, around 1972 and was in existence until just 1976. During that period, Pyramid Records only ever released fifteen albums. No more than 50-100 copies of each album was released. These releases were either given away to friends, with the remainder sold in clubs or art galleries. Never were Pyramid Records’ releases sold in Cologne’s many record shops. Maybe that explain why nobody seemed to have heard of Pyramid Records? Meanwhile, debate and speculation surrounded the Pyramid Records’ story. Nobody seemed to know anything about the label. They soon would though, when Virgin decided to release three compilations from the Pyramid Records’ tapes. Unknown Deutschland-The Krautrock Archive Volume 1 was released in 1996. Later that year, two further volumes were released. The release of the compilations only fuelled debate and speculation. The genie was out of the bottle. Since then, every aspect of Pyramid Records has been pored over and debated ad infinitum. This includes who recorded and produced the music, when and where. Some sceptics have even questioned the very authenticity of the music, believing the discovery of the Pyramid Records’ tapes was a hoax, and the work of a studio band? Other sceptics have even questioned the existence of the label itself, believing it was nothing more than a vanity label? Certainly, Pyramid Records was never going to rivalled Brain Records nor Ohr. It was never meant to. Instead, Pyramid Records was a small, obscure and private label that released music its founder Robin Page believed in and championed. That’s why hardly nobody had heard of Pyramid Records when the Pyramid Records were rediscovered. This was the start of twenty years of controversy, conspiracy theories and speculation. 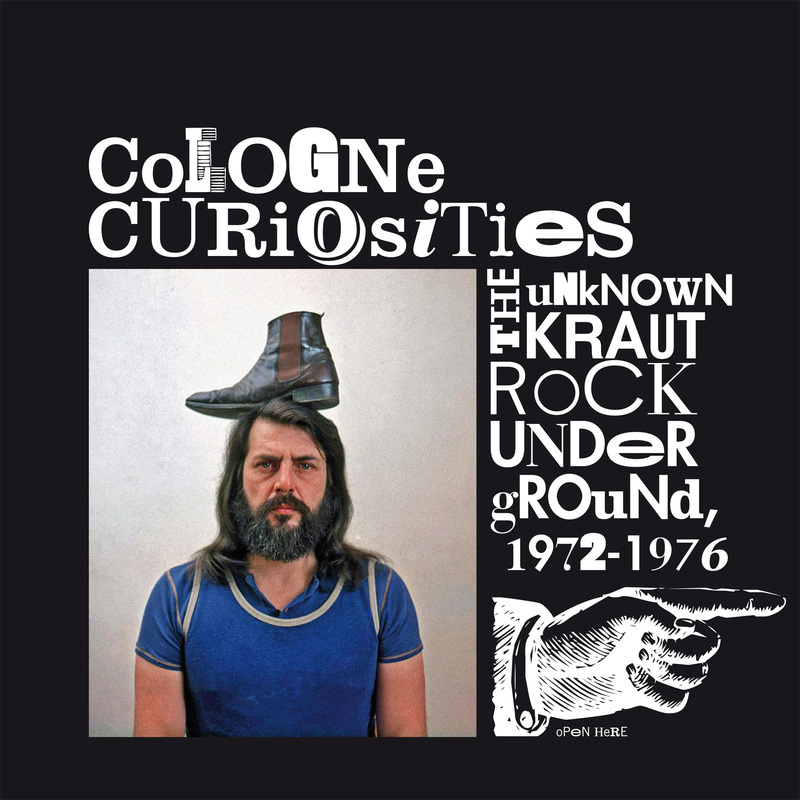 Adding fuel to the fire, will be the release of Cologne Curiosities-The Unknown Krautrock Underground 1972-1976. It was released by Mental Experience, an imprint of Guerssen Records and features seven tracks from the Pyramid Records’ vaults. This includes seven tracks from the Unknown Deutschland series. They make a welcome return, forty-four years after the first Pyramid Records album was released. The story began in 1969, when Robin Page, a thirty-seven year old artist and leading light in the Fluxus movement, decided to move from England to Cologne, in Germany. He wasn’t the only expat in the city. Tony Robinson was a South African, who had travelled from Cape Town, to Germany where he would first work with Karlheinz Stockhausen, the Godfather of modern German electronic music at WDR Studio. This was akin to serving an engineering apprenticeship, and would serve Tony Robinson well. When he left Karlheinz Stockhausen’s employ, Tony Robinson went to work at Dierks Studio in Cologne. That was where the future Genius P. Orridge would meet Robin Page. By then, Robin Page was a successful and established artist. He was a leading light of the Fluxus movement, and was regarded as a groundbreaking artist. Robin Page used humour within his work, which sought to challenge what was regarded as good taste within the art establishment. Before long, Robin Page’s painting found an audience, and became sought after. This had been what Robin Page had dreamt and worked towards since ‘leaving’ art college in Vancouver under something of a cloud. That seemed a long time ago. His new found success and financial security, allowed Robin Page to work towards fulfilling another of his dreams, making music. Robin Page was serious about making music, and had a studio in the basement to what looked like to anyone passing by, a derelict building. Deep within its bowels, was Robin Page’s studio, and where Pyramid Records first album was recorded. It was then pressed by a Turkish entrepreneur, who just happened to keep his cutting lathe within the same building. Although was more used to producing bootlegs, but was able to cut what became PYR 001, Pyramid Records’ first ever release. It came wrapped in a cover designed by a local art student. History had just been made. One person presented with a copy of PYR 001, was Toby Robinson who by 1972, had become friends with Robin Page. He was persuaded to provide the material for PYR 002. Essentially, this comprised a recording of sounds bounced from one tape recorder to another. Again, a master was cut, between 50-100 copies were either given away to Robin Page’s friends, or sold in Cologne’s art galleries and clubs. No copies of PYR 001 nor PYR 002 seem to have survived. It’s a similar story with the label’s next two releases. Neither the master tapes nor copies of PYR 003 and PYR 004 seem to have survived the passage of time. Instead, the first Pyramid Records release to survive is believed to PYR 005. It’s one of just eleven recordings that remain. These recordings were made between 1974 and 1976. The Pyramid Records’ recordings are said to have been recorded at Dierks Studio, in Stommenin between 1974 and 1976. During this period, Tony Robinson was variously, an assistant, second engineer and technician. Mostly, he worked nightshifts, when many bands came into the studio to practise and record demo tapes. Sometimes, though, when things were quiet, various musicians arrive and take part in impromptu jam sessions. Tony Robinson would press play, and would not just record these sessions, but take part in them. Some of these jam session featured members of various well known German groups, who would morph into a supergroup. They would play through the night, with Tony Robinson taping the sessions. There was a problem though. Each of these musicians were contracted to record companies. It seemed impossible to release the recordings. That was unless each of musicians adopted an nom de plume. Each musician who played on the jam sessions was given an alias. When the albums were released, there was no clue to some of the musician’s true identity. Some of the aliases were wholly unconvincing, with a myriad of anglicised names featuring on the releases. Considering the sessions had been recorded in Germany, this would’ve been far from convincing. Fortunately, the albums were released in small quantities. Still Pyramid Records’ continued to release just 50-100 copies of each album. They were pressed by a friend of Robin Page’s who owned a pressing machine. While some of the releases still came wrapped in a hand made cover, others came complete with mass produced cover. The Pyramid Records’ album covers were never regarded as works of art. They were purely functional. What mattered was the music. This seems strange considering Robin Page’s artistic background? Usually, an artist would’ve realised the importance of an album cover. That doesn’t seemed to have been the case with Robin Page. He could’ve quite easily designed his own album cover. Instead, Robin Page used utilitarian album covers. Their function was merely to protect the album. They were neither memorable, nor design classics like so many Krautrock albums. However, Pyramid Records wasn’t really in business to make money. Many of the 50-100 copies of each albums were given away, with the remainder being sold in art galleries and clubs. Hence the later accusations of Pyramid Records being a vanity label. That was still to come. Before that, Robin Page called time on his dalliance with the music industry in 1976. For four years, Robin Page had fulfilled his other dream of making music. He had taken this further by releasing other people’s music. This he only did on a very small scale. Robin Page didn’t see music as a way to make money. Instead, his actions could be construed as a mixture of benevolence and small scale philanthropy. Maybe Robin Page wanted to highlight and champion new and exciting music, including music that other labels wouldn’t release. However, in 1976 Pyramid Records closed its metaphorical doors for the last time. Later, Robin Page would emigrate to Canada. With him, he took Pyramid Records’ master tapes and the remaining albums. Almost nothing was left of Pyramid Records. It was as if they had never existed. That was until nearly twenty years later, when Tony Robinson approached Virgin Records with some of Pyramid Records’ master tapes. This resulted in the release of Unknown Deutschland-The Krautrock Archive Volume 1 in 1996. Later that year, two further volumes followed. This further fuelled the mythology and speculation that built up around Pyramid Records. Since then, the Pyramid Records’ story has been debated ad infinitum. It’s been the source of much speculation by connoisseurs of Krautrock. Sometimes, though they become too caught up in the Pyramid Record’ backstory, and forget about the music that Pyramid Records released between 1972 and 1976. This includes the music on Cologne Curiosities-The Unknown Krautrock Underground 1972-1976. It features seven tracks from The Astral Army, Spirulina, Chrónos, Neil Andersen, Baal, Ten To Zen and Fuerrote. They’re an eclectic selection of genre-melting tracks that showcase the music Pyramid Records released between 1972 and 1976. Opening Cologne Curiosities-The Unknown Krautrock Underground 1972-1976, is Interstellar Shortwave by The Astral Army. Their lineup is listed as Gunther Dorn, Herbert Metzger, Otto Bretnacher and Wolfgang Willhauk. They’re obviously aliases, and also talented musicians, who were capable of recording what was a commercial sounding track. It originally featured on Unknown Deutschland-The Krautrock Archive Volume 1. On Interstellar Shortwave, the sound of a shortwave radio, gives way to a glorious slice of hard rocking music. Add to this a hint of punk, electronica and experimental music, and the result is a potent and heady brew. It’s sure to whet the listener’s appetite to the rest of this veritable musical feast. Originally, Spirulina’s The Message Unknown Deutschland-The Krautrock Archive Volume 2. Straight away, the words spacey, lysergic, dreamy and mesmeric come to find. Pink Floyd seem to have been the reference point for this ten minute epic jam. Spirulina’s rhythm section lock into a groove, and are augmented by washes of organ, keyboards and guitars. Effects are used effectively, in what’s a truly timeless, psychedelic, space rock jam. It features a truly talented band, whose real identities sadly, are unknown. Amongst the various pseudonyms on Chrónos’ Schaudernacht, one is instantly recognisable. That’s The Mad Twiddler, one of the many aliases of Tony Robinson. He plays guitar, synths and cowrote the track. Tony Robinson’s synths pulsate and bubbles, as his guitar drives the arrangement along. Meanwhile, the drums provide the heartbeat, as the rhythm section lock into a groove. The drums are something of a conundrum. Sometimes, there’s a seventies sound, while other times they’ve a later, post rock sound. Similarly, sometimes, the synths don’t have an authentic seventies sound. Maybe, Schaudernacht was an unfinished track, which was completed at a later date? However, if that was the case, why not fix the several mistakes in the drum parts. Despite this, it’s a captivating, genre-melting track that brings to mind Krautrock’s glory days. Accompanying Neil Andersen on Feuerwerk is Tony Robinson, who plays guitars and synths. They’re the only musicians credited on the track. Despite that, there’s much more happening, in what’s a complex, multilayered mix. Effects are used, as instruments intertwine and effects are deployed. Sometimes, instruments make a brief appearance, only to disappear and reappear. They combine elements of avant-garde, Berlin School, electronica, experimental and improv, to create an innovative and urgent track that mesmerises and is strangely melodic. Baal’s No God/Astaroth is a collaboration between three members of The Astral Army and Spirulina’s drummer. This is akin to the Pyramid Records’ all-stars. They create what not just the heaviest track on the compilation, but one that’s dark, haunting and otherworldly. At the heart of the arrangement is a kerosene soaked, and drug fuelled, dramatic vocal. It’s delivered above an improvised arrangement, where the rest of the Baal, combine blues, rock and psychedelia with jazz. This results in a heavy, cinematic, otherworldly and unforgettable sounding track. There haven’t been many groups that feature a trio of synth players. Especially one whose music is improvised. That’s apart from the wonderfully named Ten To Zen. Their contribution to Cologne Curiosities-The Unknown Krautrock Underground 1972-1976 is Innerst. It features a myriad of futuristic and sci-fi sounds. This includes beeps, squeaks, whirrs and buzzes aplenty. They carefully crafted into a cinematic sounding track that would provide the perfect backdrop to a sci-fi short. Closing Cologne Curiosities-The Unknown Krautrock Underground 1972-1976 is Ganz Wie Du Willst by Fuerrote. Their lineup features some familiar faces, including Neil Andersen and Toby Robinson. The third member of the trio is guitarist Hans Lorenzen, who helps sculpt an epic fourteen minute soundscape. Straight away, Fuerrote’s reference points seem to be Amon Düül II and Popol Vuh. There’s even hints of early Klaus Schukze and Manuel Göttsching as Fuerrote deploy three guitars and two synths. Soon, a multilayered, improvised jam is unfolding. Buzzes and feedback combine with percussion, crashing cymbals and searing guitars. Occasionally, eastern sounds emerge from a soundscape where avant-garde, Berlin School and electronica combine with experimental, psychedelia and rock. Together, they create a Magnus Opus, which is a tantalising taste of further instalments from the Pyramid Records’ vaults. Cologne Curiosities-The Unknown Krautrock Underground 1972-1976 was recently released by Mental Experience, an imprint of Guerssen Records. It features seven tracks from the Pyramid Records’ vaults. They’re designed to whet the listener’s appetite for future reissues of albums released by Pyramid Records. These will be very welcome reissues, as the original albums are now extremely rare, and almost impossible to find. Anyone who happens to come across an original Pyramid Records’ release is one of the lucky ones, given how few copies were released. Between 50-100 copies of each Pyramid Records’ album was released. Only PYR 005 to PYR 015 remain. The first four albums are lost in the mists of time. However, at least the remainder of one of what’s one of the smallest Krautrock labels remains in tact. Much of that music is innovative and way ahead of its time. That was the case with so many of the Krautrock and Berlin School albums released. It was only much later that they find an audience and are receive the recognition they deserve. That should be the case with the music on Cologne Curiosities-The Unknown Krautrock Underground 1972-1976. Alas, far too many people have become bogged down by the controversy and speculation that surrounds the Pyramid Records’ story. It’s as if they’re determined to disprove that the music was recorded between 1972 and 1976. In doing so, all they’re doing is adding fuel to the fire, and fuelled debate and speculation. That’s a great shame, because for too long, people have become caught up in the Pyramid Records’ mythology. In doing so, they loose sight of the important thing, the music, including that on Cologne Curiosities-The Unknown Krautrock Underground 1972-1976. That’s a great shame. Maybe now is the time to concentrate on what matters, and that’s the music that Pyramid Records’ released? It’s unlikely that the truth will out. Only two people knew the whole truth. Sadly, Robin Page passed away in 2015. This means the only person that knows the Pyramid Records’ story, is Tony Robinson. Alas, he admits that heavy LSD usage has blurred his memories of Pyramid Records’ years. It seems that the true story of Pyramid Records will never be known. As a result, there will always be doubt in some people’s minds about the Pyramid Records. Still the sceptics will continue to doubt some aspects of the Pyramid Records’ story. Some of the biggest sceptics will continue to question the very authenticity of the music. They will argue that some, or all of the music was recorded at a later date, by session musicians as some part of elaborate hoax. However, what would these Cosmic Jokers get out of this? That the Pyramid Records’ story is part of some elaborate hoax seems too farfetched. It seems more likely that the music on Cologne Curiosities-The Unknown Krautrock Underground 1972-1976 was recorded between 1972 and 1976. However, it may well be that the once the Pyramid Records were rediscovered, occasionally some work was carried out to complete or sweeten a track. This sweetening maybe transformed an unfinished track into a more cohesive and complete track. An example of where some work may have been carried out a later date, appears to be Chrónos’ Schaudernacht. Some of the drums and synths sounds have a seventies sound, while others have a later sound. That’s the only example on Cologne Curiosities-The Unknown Krautrock Underground 1972-1976. The rest of the music on Cologne Curiosities-The Unknown Krautrock Underground 1972-1976 has been untouched. It’s how it was recorded for Pyramid Records between 1972 and 1976. There’s been no overdubbing, with the music no different to the day when it was recorded by at Dierks Studi by Tony Robinson. He’s the last man standing in the Pyramid Records’ story, which released fifteen albums of mostly innovative, inventive and influential music between 1972 and 1976. Sadly, Pyramid Records doesn’t receive the credit it deserves. ← WHATEVER HAPPENED TO ALICE CLARK?